Two o'clock on a Tuesday afternoon. We're in the hallway outside Viggo Mortensen's suite at the Regency Hotel in New York, and we've knocked on the door but there is no response. Camillo, from Argentina, who works for the movie company, knocks again and this time there's a muffled answer. Mortensen opens the door. His expression suggests that he's just woken up but his appearance is crisp - dapper, even. He is wearing a three-piece charcoal-gray suit and looks like a Danish businessman. "Sorry," he says gently. "I was in the other room." Mortensen's manner is low-key and earnest. There is nothing fierce about him except his cheekbones. His looks are wholesome, boyish; he's physically beautiful but delicate and far from macho. He disappears for a moment into the other room, and when he returns he hands me a heavy rectangular book. It's a book of photographs - his photographs, published by his own publishing company, Perceval Press. The book is called Miyelo, inspired while Mortensen was on location in the California desert shooting his next film, Hidalgo. It is loosely based on the massacre of the Lakota Indians at Wounded Knee Creek in 1890. The photographs are abstract, colourful, blurred images of the Lakota, and are accompanied by quotations from T S Eliot and Khalil Gibran, as well as the words of the Lakota themselves. Mortensen writes in the introduction to the book: "It is hoped that the words and images in this book might in some way serve as reminders of sacrifices made by people on all sides who suffered from cruelty, confusion and ignorance in the past. May we look forward with some understanding of what is behind us, and an interest in making the best of what lies ahead." It's too early to tell whether Mortensen is pretentious or merely well intentioned. But the gesture establishes right away that he is an artist. That's clearly how he wants to be perceived. Mortensen writes poetry and paints, although he only started the latter when he was offered the part of the painter in A Perfect Murder who was Gwyneth Paltrow's lover, and he asked the director if he could do the art for the movie. He wants to make an impression, to be seen as more than a movie star. He is good-natured, conversing amiably in fluent Spanish with Camillo, and there is guilelessness about him, a sense that he is still perplexed by the attention and privilege that The Lord of the Rings has brought him. We have an hour, the movie-industry standard for press interviews. They don't want journalists getting too close: that would give them too much time to get under the skin. But there's something about Mortensen. It becomes apparent he does want us to get to his core, to understand him, or at least the person he wants to be. Maybe that's why the one-hour interview turns into six hours. It meanders and elongates; a drink at a bar is bolted on, then a walk in Central Park, but it doesn't stop there. He wants to keep talking and it extends into the afternoon with a stroll through Manhattan. It continues into the early evening and to a tepid cup of coffee in a cafe. It's nearly eight o'clock before he remembers he has to be at a dinner party with his fellow Lord of the Rings actors. And still he lingers. It's possible he doesn't want to go, doesn't feel he's "explained" himself yet. It's obvious Mortensen isn't here just to plug a movie. Not once throughout the day does he seem rushed or uneasy. His willingness to give his time seems grounded in a desire to be taken seriously. We see Aragorn on the movie posters, on the side of a bus, on the big screen. He wants us to see Viggo - but what's there to see? We'll find out somewhere - in Central Park or maybe while waiting for the walk signal or window-shopping on Madison Avenue. But not in his suite at the Regency, apparently. Mortensen, who is 45, sits and takes a sip of tea through the spout of a South American maté cup. His bohemian nature works well for him both as a movie star and as an artist. At first glance he's intriguing. His introspection and his instinct to analyze set him apart. Aragorn has made him the object of desire for millions of women and he appears perplexed by that status. But is it feigned? Can he really be that modest or naive? Proud of his work in The Lord of the Rings, he's eager to discuss it. He settles into an armchair, lights up a cigarette and there is a distinct feeling that he is doing his duty - surrendering to the promotion. He has shown up and is wearing the suit, but given the choice he would much rather be somewhere else, wearing a T-shirt. He leans back, tucking pieces of sand-coloured hair behind his ears, and speaks lovingly of how it feels to return to New York City; coming in over the bridge, the rush of the skyline. His sentences are languorous; words are chosen with precision. He was born in New York but grew up in Argentina with a Danish father and an American mother, and at the age of 11 his parents split and his mother moved him and his brothers back to the United States. He lives now in Los Angeles with his 15-year-old son, Henry, whose mother is Mortensen's ex-wife, Exene Cervenka. He spent 15 months living in New Zealand, and the enormous success of the trilogy is not lost on him. He is now a household name who nurtures the role of shy, retiring, reluctant hero. The films' were a last-minute thing. The British actor Stuart Townsend was originally cast to play Aragorn, the benevolent warrior king, but it was decided that he looked too young for the part. Peter Jackson, the director, drafted in Mortensen, whose son, Henry (then 11), was a fan of the books. Influenced by Henry's enthusiasm, Mortensen took the role, sensing that it would be a once-in-a-lifetime opportunity. Now it is difficult to imagine anyone else in the role. He has successfully captured Aragorn's authority and his sadness, characteristics that Mortensen relates to and aspires to. He seeks higher artistic ground than movie stardom and claims to be unmoved by commercial measures. "What happens after the process we go through - how much money the movie makes, or how successful people deem it to be, or is it fair that Peter Jackson didn't get best director - none of that matters. Those are results beyond the scope of telling the story, as far as I'm concerned." One of the more striking things about Mortensen is that his temperament seems peaceful and even, but underneath there is clearly something unsettled, hungry and dissatisfied. It's hard to imagine him getting worked up and he agrees he's not confrontational. When he does argue, does he admit he's wrong first? "A lot of times, not. But I'll always feel bad later if an argument has happened and unless someone has exhibited cruelty and unfairness, more to someone else than to me...Well, that might be someone I don't want to talk to, but if we get into an argument then generally I would probably call them later, because I'd want to make amends. "I like to resolve things. I like to feel everyone's gotten a fair chance. I can be judgmental about what I perceive as cruelty - someone who puts themselves before the good of the group - and I think that is a real danger that is... evil, self-interest at the cost of the group. In our story, the Ring has been compared to many things - for example, nuclear weapons. Ultimate evil. And I think in our country today, the Ring is more akin to the rash of ever-expanding legislature and, uh, programs, concepts, pacts with ominous names like 'homeland security'- those are intimidating, grand names for things that essentially have to do with controlling people's wills and people's behavior from a distance." There's a knock at the door and Camillo enters. There is another exchange in Spanish. Time's up. Mortensen asks for more and he is told he's got to view some of the footage of the third film. He turns to me - there's more that he wants to share. "What part of town will you be in? You can give me your number or something, and I can change and meet you in a bar." As an actor, Mortensen has shown that he can be versatile. Whether he is a professional baseball player in rehab, in 28 Days, or a suitor to Nicole Kidman, in The Portrait of a Lady, or a hard-core army lieutenant, in GI Jane, he inhabits the roles with authority. When asked about the remake of Psycho, directed by Gus Van Sant, he softens. "I laughed every day making that movie. There is that scene in a hardware store with Bill Macy - he's just hilarious. He seems like someone who always has an absurd take on what's going on. And Anne Heche - I could tell she just thought I was such a dummy!" Maybe that's a clue to him; perhaps he has the actor's perpetual fear of being seen as vacant, that behind the role there's nothing much more to the man - a dummy. So what upsets him? He's quick to respond. "I think there's no excuse for anyone to be bored. I have this ongoing argument with my son. He says, 'Well, you don't understand what my science class is like.' But I say to him, 'You can find a way not to be bored. What is interesting?' I think boredom is a luxury. I think anger, frustration and pessimism, misery wallowing and self-pity - I'd rather hear that, and I'm more tolerant of that in myself even than 'I'm bored.'" He is growing increasingly animated. "There is no excuse in life for f***ing being bored!" We're getting somewhere. Mortensen's intolerance - or fear - of boredom fuels his urge to be creative, pursue poetry, art and photography to the point of owning his own publishing house so that he can be heard. Here is something tangible. He chooses solitary pursuits to indulge himself. While most movie stars parade a taste for expensive cars, homes, women, golf and top billing, his need is to be perceived as something wholly serious and wise. Playing Aragorn makes him famous but doesn't satisfy his desire to express himself. Trying to be an artist means he won't waste time or be bored or, worse, be boring. "I have never been in a natural place and felt that that was a waste of time. I never have. And it's a relief. If I'm walking around a desert or whatever, every second is worthwhile." And is there such a thing as wasting time? He is thoughtful but adamant. "Oh, you can drive yourself crazy thinking that. Why didn't I do anything while I was there, I was in the presence of so-and-so and I never asked whatever. Or I was in that city and I never went to go see that painting or that church, or I should have had the soup." When asked what else he has no tolerance for, he says solidly: "Cruelty. Deliberately going out of your way when you have a choice to make someone feel bad." There's another knock on the door. Mortensen says: "You better give me your number and I'll call you." He writes it down in a notebook. Time passes. An hour later, the phone rings. There is a deep, casual voice: "Hey it's Viggo." Like we've been friends for years. We have a brief discussion about where we should meet and, for the sake of time and convenience, decide on the Oak bar at the Plaza hotel. When he shows up, he has changed out of his suit and is wearing blue jeans, a checked shirt and a polar fleece jacket, and he is holding a camera. Now he could be a Danish tourist. The bar is crowded and noisy and as we linger, discussing whether or not to go somewhere else, Mortensen is recognized. He responds with kindness - there is no false humility he shakes the man's hand, says thanks. He slides into a booth and orders a whisky, straight up. There is a painted mural on the wall and he is staring at it. Despite being part of the film business - a world that requires him to be social - he is a solitary person. He is nodding now, forcefully, at this assessment and explaining he doesn't feel he has enough time to himself. "I have friends who I get along with who I know get very uncomfortable being alone, unless they're with people, talking all the time. Whether it's on the phone, or in person, they're never by themselves. Whereas I could be alone for months." When asked what's the longest he's ever gone without talking to someone, he pauses for such an extended length of time that he then laughs. "I did a movie once directed by a guy named Philip Ridley, from London. "The movie was The Passion of Darkly Noon. Mortensen's character lived in the woods with his sister and was a deaf mute. "So I was on a plane - I got to east Germany, where we were shooting - and decided I would go for an entire day without making a sound. I get there and this guy picks me up - he was the producer - and I wrote a note that said, 'I'm not going to talk for a day or so, just to get the feeling of what it's like.'" He smiles, remembering that it made for an awkward ride from the airport to the set. An hour and a half of the producer chatting, essentially, with himself. "As soon as I stopped talking, I felt so calm. Most of what we say, we don't really mean to say. So I thought, 'Well, I'll do it another day.' And I went through with it - through meeting the crew and the costume-fitting. No one had met me before, so they didn't know otherwise. And I liked it and I decided I'd just keep going. So for the whole f***ing movie, I didn't say a f***ing word." The shoot lasted four weeks. Mortensen didn't make one sound. Remembering it, his voice fills with warmth. "Yeah, I really enjoyed it. I keep telling myself I have to do that again, because I felt so relaxed. And it was funny because people treated me like I was mentally handicapped." He would hang out with the crew, passing notes to them in a bar, or on the set. "I'd scribble lots of notes." He'd order food by pointing. "I was peaceful and happy - I just really liked it." So he didn't say a word. Not one word out loud. Not even when he was alone in the shower? "No!" Not even an "ugh" or an "eh"? "No, I did not. Because my son at that time was about eight years old, I faxed my ex-wife and said, 'I'm not going to be speaking for a while, but I will call. And can you put Henry on the phone?" He laughs again. "So I'd call and she'd say, 'Hi,Viggo, how are you?' and I would be like..."
He is silent for about 10 seconds, breathing demonstrably through his nose. And how did his son know it was him? "She would put him on the phone and I would be breathing so he could hear I was there. And he would tell me what was going on - but you know kids, they don't really say a lot on the phone anyway - and he'd go on about stuff and I'd make a sound to let him know I was still there, and then she'd get on and ask, 'So you'll be home in two weeks? Three?' And there are certain breaths, or I would make clucking sounds." Mortensen is laughing now, surprised and amused with his own behavior. "The only word I said the entire time was the word "no". The World Cup was going on - I think it was Brazil, and whoever won I didn't want them to win - and I fell asleep watching the game and I wanted to know the end of it and I went to the guy next door. I was half asleep when he told me the score and it just came out: He utters, under his breath, a tiny "no". Highlighting the hilarity of the fact that he can maintain silence with his son, his work and in every area of his life except sports, he clarifies: "No, not sports - soccer. It's different." It is 5:30 in the afternoon now. A perfect autumn day. We cross the street and walk into Central Park - strolling, smoking. Mortensen stops to take a photograph of a dog then sits on a bench overlooking the pond. "By doing that movie where I didn't speak, I ended up feeling that most of what I say, I don't need to," he says. "But we speak, to make sure we're understood." 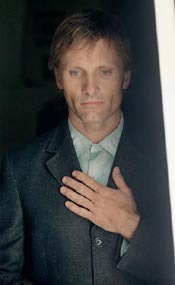 Occasionally, people who walk by will do a double take - nah, that guy just looks like Viggo Mortensen. The real Viggo Mortensen wouldn't be hanging out on a bench with a camera, would he? But this is how he lives. He does not insulate himself from the world - just, maybe, from who he is rather than who he wants to be: himself. Sitting casually, hanging out on the bench, seems ideal. But there is a problem. There are rats. Many of them. They are running back and forth between the bushes, over the footpath, and it is impossible to ignore them. "Wow. They're bold," he says, incredulously. A couple of Brazilians pass by. "Hey - I could ask them who they played in the World Cup final." He jumps up off the bench, leaving me alone with the vermin. As he stands chatting with the Brazilians, a small huddle forms around him. Next thing, he is posing, arms draped around them, for a photo. He looks back at me over his shoulder with an expression that says "Oops." Minutes later, he returns. "Yeah, in the final it was Brazil against Holland. I didn't really give a sh** but I was rooting against Brazil - I grew up in Argentina." But Brazil has never met Holland in a World Cup final: it was the semifinal in 1994. No matter, he's still impressed by the rats. "Whoa! Did you see that one? That was a rat-a-roo. Is it a herd of rats, a flock of rats? Maybe it's a swarm." The sun is setting now, and we leave the park and cross Fifth Avenue, chatting. He doesn't own a television. He spends time with his son. He loves a restaurant on Ninth Avenue called Supreme Macaroni Company and wonders if it's still around. As we pass Barneys, the swanky department store on Madison Avenue, he pauses in front of a window display. He peers inside and notices that a store worker is setting up a camera on a tripod to take a photograph. Mortensen holds his camera up to the glass and knocks. Just as the guy turns around, he snaps. He is enjoying himself, being playful. It's possible that he has periods of darkness and turmoil, but right now, what comes across is someone who is content with himself and not particularly haunted or brooding. We reach his hotel. "Let's keep walking," he says. There is still some time left before he has to go to dinner and it seems there are still things he has to say. Soon he will have to meet his fellow actors from The Lord of the Rings. It is dark as we hit Lexington Avenue and he bumps into some friends from South America. Everyone is very excited. They speak in Spanish, exchange phone numbers, kiss on both cheeks. We are about to go for a cup of coffee but I need to run quickly across the street to a cash machine. He says he'll wait in front of the coffee shop. When I return, he is standing there, holding two bouquets of flowers. He hands one to me. I ask him who the other one is for. "For the room," he replies. We head inside. Mortensen is not in a relationship and, when asked whether he misses it, he hesitates. "No, not really. I don't have time to be with myself, much less be with someone else right now." But that's not entirely true, because he admits that if the right person came along he would make the time. So the truth is not that Mortensen doesn't have the time - just that he makes time for what really matters to him. It is now 7:45 pm and he needs to get going. We stand for a few more minutes on the corner of Lexington Avenue, saying goodbye. The adventure is over and, just as we are about to part, we revisit, briefly, the subject of lack of time. He sounds rueful. "If I can get a day to myself, I won't answer the phone, I'll read or go for a walk. Simple, basic things. People think there's always time to do that but there isn't. Life is short." For someone who feels that he has so little time, a contradiction is raised in his willingness to linger. But the six hours we have spent together are not about killing time or being lonely. They have been about Mortensen's determination to make an impression - not as an actor but as a man. He just wants to be a hero.